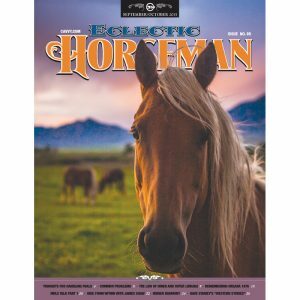 In the early 70s, I would go to Nevada and help Bill Van Norman start the ranches’ colts in the winter. 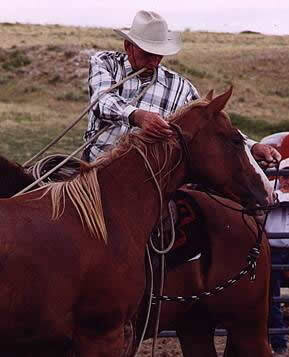 He had recently married Ray’s oldest daughter, Geri, and having had the opportunity to work around Ray some, he had a lot of new ideas on horses that he shared with me. Bill was a real good hand in his own right and had been around some good buckaroos in northern Nevada. Being around Bill and these other guys, I had them on a pretty high pedestal, but they talked about Ray Hunt like they had him on a pedestal. If these guys had Ray on a pedestal, I thought he must not be to far away from God. One summer Ray was coming to Van Normans and Bill invited me to come to the ranch to work with Ray. He showed up in a one-ton stock truck made to haul 4 horses and he had 6 or 7 in there. He could get more horses in a truck or trailer than anyone I’d ever seen. When it looked like he had them as tight as he could, he would send his old bridle horse in and he would put his head to the side and hit the other horses with his shoulder and knock them forward. Before the wave he created returned, the old horse would get his hindquarters in the corner and Ray would shut the gate. Bill had a water gap where the cattle from outside could water on the creek below Reed Station where he lived. It was about 50 yards wide and twice that far to the creek from the gate. There were cattle lying on the creek banks in the willows and we shut the gate so they couldn’t get out, then Ray would drive one cow from the creek toward the small end of the trap and the gate. If the cow would get by him and try to get back to the other cattle, his horse would have to work harder to get back between the cow and the rest of the cattle, at which time he would let them relax in position when he got the cow stopped. This experience of working cattle with this principle is the basis of the “A Pen” as I labeled it for lack of anything better, and it all started with my first lesson with Ray 35 years ago. 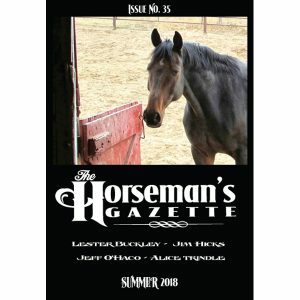 I believe it may have been that same summer, Ray showed a bridle horse at the Elko Fair in the Open Class. At that time the eliminations were in the morning and the finals in the afternoon. There was reined work, herd work and single cow work. Ray made the finals and in all six works, I never saw him pull the reins tight once. To this day, I have never seen anything like it in the show pen. Six runs at top speed, dirt flying and Ray and his horse were so cool, just like a walk in the park. Not only did he display great horsemanship, but he did the reining backwards and received a zero. When he got last place and asked the judge what he had done wrong, he laughed at himself, didn’t cuss, wasn’t upset, just a good sport about it. Over the next few years I had the opportunity to work with Ray, before he started giving clinics full time. It was something I wish more people could have witnessed, especially my kids. 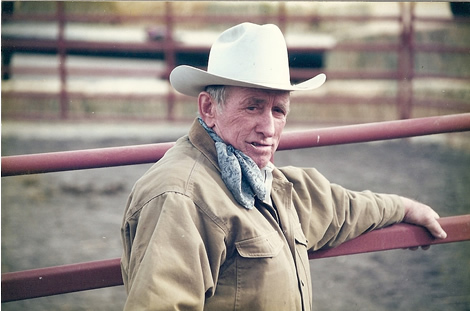 A guy asked me once, “Who was the best all-around cowboy you worked around?” I said Ray Hunt, even though he expected me to say Tom Dorrance, but I never worked with Tom on the ranches like I did Ray. Ray was always in the right spot gathering and working cattle; he could have roped with the guys at the Californios and been right at the top. I never saw him buck off. He always kept a bucking horse busier trying to stay out of trouble than the horse could keep him trying to ride it. He also was one of the best horse shoers I’ve ever been around. 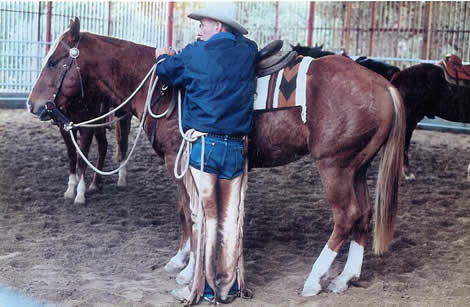 For a while, he taught at Cal Poly and of course shod his own horses on the ranch and for the show pen. Some of the things I learned about shoeing as a teenager from Ray are the same principles I use today after seeing a lot of high-dollar educated farriers. 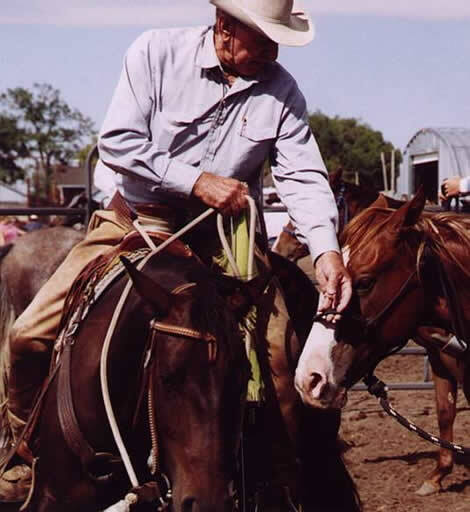 Ray knew how to shoe a horse to ride in the mud and rocks chasing wild cattle or to ride in the show pen and keep them sound as they got older. We all know of Tom’s message that helped so many of us with our horses, but I am thankful for Ray for being his messenger. Not only could Ray talk about it, he could do it better than anyone. One of my most cherished times in my life was working for Ray in Nevada in the ’70s. One particular time was when we were gathering cattle in the fall. We were a long way from home with a little bunch of cattle that we had to get home. It was really cold and late in the day. We took turns walking a foot to warm up while the other kept the cattle moving in the right direction. We reached our destination about 1 a.m. As long as that day was, it never felt like it to me. Ray did to me what he did to his horses. We both wanted to be with him and I still do. After learning of the death of Ray Hunt and thinking about his life, I began to ponder how he affected mine. Most people know him from his clinics around the country. I never went to very many of his clinics unless they happened to be close by. I first met him in 1968 when I was still in high school through our mutual friend Bill Dorrance. Since then I had worked for him four different times, either starting colts or cowboying on ranches. One memorable time we started colts and took care of 4,000 head of heifers and blended our colts in on the cow work. This was especially fun because we had a lot of roping to do on those colts. Ray was almost 25 years my senior and a really good hand which made it exciting for me. It was so valuable because we were constantly comparing our horses and he seemed to have a real passion for my progress. We had a chance to trade horses quite a bit, so I could feel how he had something going and how he coped with what I didn’t have going. It was really a benefit for me to see how my horses would change in a short time with him, then feel how different they were when I got back on them. It was frustrating to me that oftentimes that new feel wouldn’t carry very long after I got back on. I could see it, I could feel it, but I couldn’t keep it. But Ray was very encouraging to me and it helped to hear stories of how he went through the same thing while working with Tom Dorrance. But despite the fact that I couldn’t acquire or keep a certain feel right then, it still gave me a goal for which to shoot. It was so exciting in time as my timing would improve on some certain phase and when I could feel a feel developed that resembled his horses. He seemed to be equally excited and having as much fun as I was. At this time I was terribly shy and though I had met Tom Dorrance and was raised a half hour away from him, I didn’t really know him. Ray insisted that I get better acquainted with him. That friendship changed my life, and if it hadn’t been for Ray, it may have never happened. 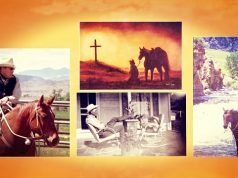 Ray loved to tell stories of his cowboy days in Nevada and I loved to hear them. He got me my first job cowboying and riding colts on a big outfit. I stayed with that occupation for the next 20 years. It was a great opportunity to practice and experiment with so many of the things we worked on while I was with him. Ray is the one that encouraged me to start in on the clinic trail, which caused me to leave the cowboy life. I’m fairly sure I wouldn’t have done that if it hadn’t been for him. I’m still trying to figure out whether I should give him credit or blame him for that one. I think back when we had a chance to reminisce on our years together and how he had me wishing I could go back to those fun days when I got paid to play. I can only guess where I’d be and what I’d be doing had he not been a part of my life. 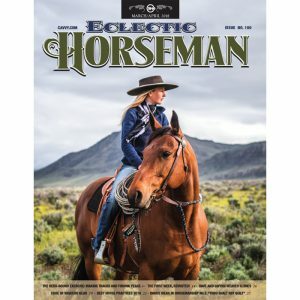 As I think about the effect he has had on horsemanship in general, I don’t think I’m exaggerating to assume that perhaps no one in the entire history of horsemanship has affected it in a more positive way than has Ray Hunt. 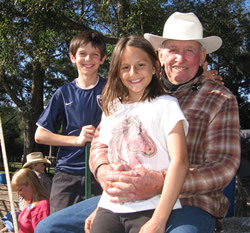 My fondest memory of Ray was watching him push my daughter on the swing in front of our house during a clinic we had at our ranch. I always felt Ray Hunt was like my second father. He was one of the most sincere people I’ve ever met. He always knew how I felt and saw what was going on with me and my horse and helped me. It didn’t matter if there were one or a hundred of us present, I always felt like he took time for me. I truly loved him and will miss him. Until we meet again. When Ray came along I thought I was getting along with my horses OK. But he could get things done with a horse I didn’t even know were possible. At the 6666’s he and Carolyn would eat supper with us, and my wife and girls got pretty attached to them. We felt like an extended family. Once when we were having a birthday party for my oldest daughter we discovered just how much Ray liked homemade ice cream… about a gallon at a time. He and my daddy were of the same generation, and if I ever needed an example of integrity, or work ethic, all I had to do was think of one of them. One time I was watching Ray ride this little gray and white paint. He was loping circles, and doing flying lead changes, and to this day, I have never seen a more effortless change, from Olympic horses, to reiners, bridle horses, etc. I said wow, Ray, that was nice! He said, not bad for the first time I loped her in a circle. I said, I hope I can do that one day. He said you don’t want to do that, you want to do it like you do it. It took me years to understand that, and while it was still the most beautiful lead changes ever, I understand and enjoyed talking to Ray about those differences, While he will always be the ultimate, it was a pleasure to become me through his tutelage. The second was a time, with a horse I was riding, and he was wanting to buck, and run away with his owner. Once I got on, he would do his “thing,” and I would do a one-rein stop. Ray would say, circle him circle him. The next time, I would circle him, and Ray would say, one-rein stop, one-rein stop, This went on for days, and the horse got over it, but it soooo seemed like I was always on the horse backwards or something. Then several years later again, I understood. I asked Ray, and told the story, and told Ray the times I did a one-rein stop, I had already gotten to the feet, so there was no need to stop the horse and go through that all over, and the times I circled, there was no connection to the feet. Ray said, it’s like Tom said, it’s about the feet, the feet, THE FEET. The third was a horse that bucked a fellow off a few times, and his wife had asked me to get on, It was on the edge, but I was just in sync and would be there right when Ray gave a direction. The horse never bucked with me and did so good. After that I just couldn’t stop learning (imagine that) and asked Ray, should I have done this or that, waited here, or done more there? Ray said when you’ve had as good of a ride as that, just enjoy it and leave it alone. 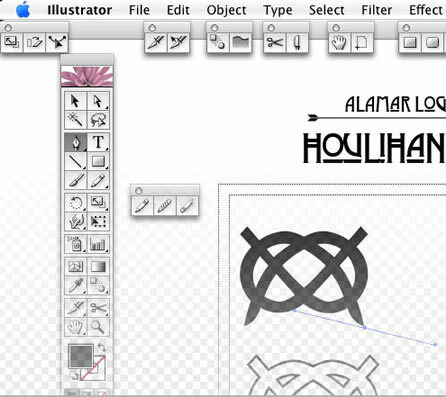 It’s amazing, how slow I was, in taking those years to get the simple lessons. As Ray might say, It’s amazing how it takes a lifetime to live a lifetime. There are so many stories, and we all have them to share, I look forward to sharing some more around the camp fire. Thanks, Ray. Keep all of us on track and save us a few to start. There is an iron mine at a place called Palisades which is half-way between Beowawe and Carlin, Nev. on the Humboldt River. At the Horse Shoe ranch we had cattle at Rattlesnake Springs and they would get in the mines pit. When they got to be a problem, the mine boss would call us up and we’d go up there and get the cattle out. There was a railroad track alongside the Humboldt River and if you could go down the tracks, you’d save about 5 miles riding. The only problem was that there were two tunnels to go thru with the cattle. We’d hold the cattle up and as soon as a train came thru and got past us, Ray would take the lead so they could be stopped and I’d push them from behind and we’d start down the tracks and thru the two tunnels, with about 10 to 20 head. After you got thru the tunnels there was a kind of cliff the cattle could get up and it was only about a mile to Rattle Snake Springs. We’d do this about once a month and never had a problem. This was in 1967 or 68. The first time we did it, I couldn’t believe that was what Ray planned, but by golly if Ray was going to do it, I sure wasn’t going to weaken on him. I just took a big chew of Copenhagen and away we went. I still think about Ray and those tunnels every time we go to Elko. At the Horse Shoe, we had a big 7/8 TB horse named David that we had started. 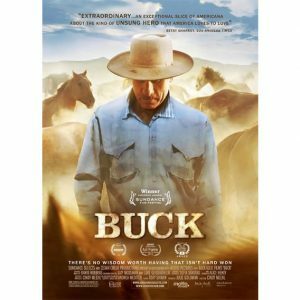 David bucked a lot with the saddle, but never bucked with us, but I always thought he would if you wanted to crowd him too much. We had a big dirt canal that brought irrigation water down to the ranch from the Humboldt River. It was about 10 feet across and just deep enough that you would have got pretty wet crossing it. We were looking for cows & needed to be on the other side of the canal. It was a mile or two to cross at the gate where the river water came into the canal. Ray decided that we could jump it and save some time. David wasn’t too sure and kind of had his feet stuck. Ray moved him around a little & got him to jump the canal–twice. On the other side there was a spot about 2 feet wide to land on and then a bank that went straight up for about 4 feet. When David jumped he landed just right with Ray leaning forward in the saddle a little. David hit the ground & jumped right back onto the side he’d just came from. Ray was leaning forward with his nose stuck out quite a ways like he thought maybe David would go up the bank too, and down he came. I’ve been with Ray in some pretty wild situations, but that was the only time I ever saw anything get him on the ground. Actually, all the time I was around Ray, I can’t ever remember a horse that bucked with him. Sometimes they’d buck with me, but not with Ray. 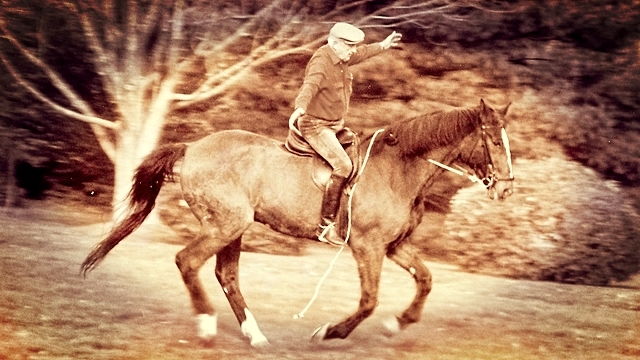 Ray Hunt was THE Master Horseman – an inspiration to all. He had a rare gift and, fortunately, he chose to pass it on to us. 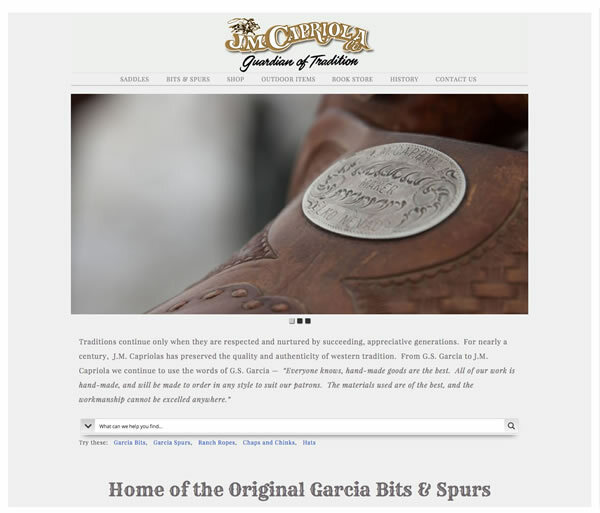 His contributions to the horse industry are worldwide and immeasurable. They have become the cornerstone of any good training program today. Ray’s principles apply directly to horses, as well as to humans. Over the years, he has opened our eyes to a whole new way. 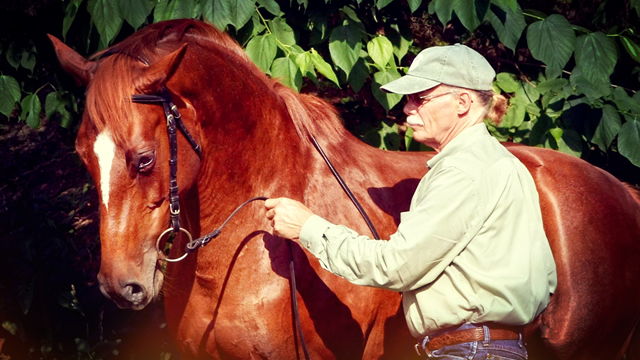 All of us in the horse industry owe Ray Hunt a huge debt of gratitude in what he has taught us in working with our horses, in a way that is fitting to the horse. Ray was the trainer’s trainer, the clinician’s clinician. He paved the way for all who have conducted clinics. Without Ray going down the road giving clinics, very few of us would have ever heard of Tom and Bill Dorrance. Ray always willingly gave credit to them. I certainly owe what knowledge I have to Ray Hunt and Tom Dorrance. I would not know many of my friends today, were it not for Ray Hunt. He brought us together. We proudly share in friendship for each other and partnership with the horse because of Ray. He motivated us toward a better spot within ourselves and with our horses. He gave us the tools to enable us to think for ourselves. He encouraged us to look within. He helped us to establish a framework on how to work with our horse: making the right thing easy and the wrong thing difficult. Even now, I hear his straightforward, powerful voice encouraging us toward a better way for our horses. Ray Hunt has had a positive impact on us all. He will continue to be a mentor for generations yet to come. Ray Hunt was a legend in his own time and will be forever. 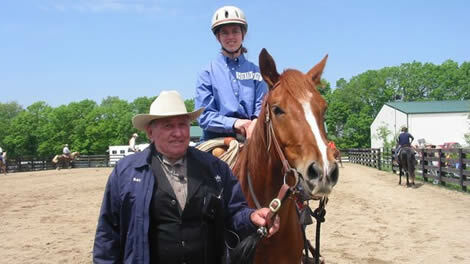 When I heard that Ray Hunt had died, I found myself wondering how many times he had saddled a horse in his life. The number must be in the hundreds of thousands. Most of us can’t put the second arm in the second sleeve of a coat as easily as Ray saddled a horse. I first saw him do it at a clinic in Wheatland, Wyoming, in the fall of 1992. I was new to saddling horses. I knew enough to know that I knew nothing about it. What I didn’t know—until a long time later—was just how much nothing that was. Ray was one of the people who pointed that out, without so much as saying a word. What I thought I saw in Wheatland was a man saddling a horse, a man who might have been saying to that horse, “Whatever you think of this is fine with me.” And he meant that, but he’d also prepared the horse to be readier for the saddle than even the horse could know. Gentle, but not too gentle, ready, but not too ready—that was how it went. I’ve wondered since how Ray found the balance between those things. But I’ve realized recently that it was never that fine a calculation. Ray was ready for the consequences, whatever they happened to be. It was genuinely okay, whatever the horse did. It was all a step in the right direction. Me, I had a mental list of things I didn’t want to see happen while saddling the horse I was starting. It was a long list. That changes everything. I did not get to know Ray well, which is something nearly everyone who rode with him will be able to say. I try to think of what that Wheatland clinic must have looked like to him, and I suppose it looked like a bunch of worried, frightened mammals trying to saddle worried, frightened mammals. No matter what you thought of being human, you would think a little less of it after spending time with Ray. I try to think of who that man was, and the best guess I’m ever going to get will come from looking at the horse he’s sitting on. She’s the purest horse in the string, the one listening and watching and feeling, with eyes as bright as we’ve ever imagined the human soul to be. Ray was beaming with pride as those two fellas handled what came their way. 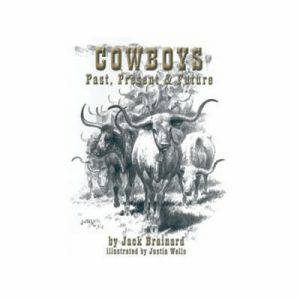 He knew what it took, he had been there in days gone by, and I could just see how pleased he was with how well Tom and Kalon did with what took place. There were some really good hands at that clinic, and there were some folks there just like me, all of us eager to learn. I rode in all three classes, and learned something in each. It was the last colt starting clinic I will probably ever ride in and I will never forget it. What was so amazing was that from the front seat of the pickup Ray shared his wisdom and had us all getting along with our young horses well enough that after the colt class the second day we took them out of the arena to the open range, and on the third day the class rode the colts following the wagon Ray was driving around and through the many hay meadows. Ray always said he was “just a guy,” but that “guy” even in his golden years was the most effective horseman I’ve ever known. The genuine article. What really left an impression on me was to see Ray with the driving lines in his hands. You could see the passion still burning within, as well as the unwavering respect he had for the horses. It was beautiful to see how much he enjoyed having the reins in his hands once again. I can only imagine what it must have felt like to the horses judging by how the team responded to him. It was truly an exceptional experience that I will always cherish, and never forget. I would have considered it a true honor to have been able to share even one day with him. It overwhelms me to call him my friend. I will miss him, and I will think of him every day I am with horses. Back in the early 1980s, I packed my bags and ventured out to Wheatland, Wyoming, to watch my first Ray Hunt Clinic. Since that time, I have been on a wonderful journey trying to figure out what it was that this man offered to a horse that a horse understood so well and was so right inside with. It is ongoing and I am sure will be for the rest of my life. For those of you that never saw this man interact with a horse, I am sorry, but I am very thankful for the memories I have. Raymond’s unique way of teaching, which made one think about what he had to say for long periods of time, even years, is what I find so special about this man. Thank you, Carolyn, for sharing him with all of us for all these past years. 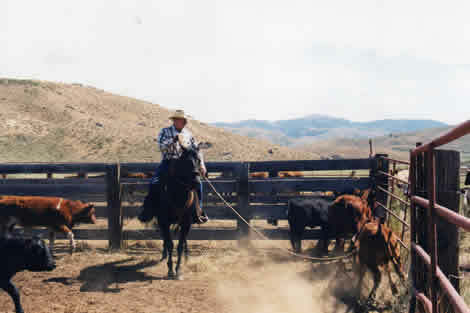 One of my favorite memories of Ray was when I was able to go to his Idaho ranch and ride for two weeks. I was the only guest staying in their house with them, so every morning I was able to sit and listen to the stories that flowed out of Ray over a cup of coffee. Unfortunately my stud horse violently coliced and died on the fifth day of the clinic. Ray had Peter, Danny and Wayne dig a hole with the backhoe and bury Diamond. After they graciously did that, Ray asked them to build a cross to honor the stud. Although Ray could seem gruff at times, he always honored the bond between horse and human. Luckily I had a colt with me that quickly got on the payroll. Ray was there every step of the way to help me take a green colt and put him on the payroll. By the last day of the clinic I was dragging calves to the fire with him. The confidence that I took away from that experience has benefited my life in everyway. Thank you Ray for all you have done for horses and the people who try to understand them. begin, and Ray was sitting up on a fence before getting on the mare he wasgoing to ride. All the clinic participants as well as the folks watching from the stands had gathered around to listen as Ray shared stories from his cowboying days, times with Tom, and some thoughts about the nature of horses. He was talking to the crowd in general when he said; “The horse is easy. The horse is already alright.” He then paused, and looked at me and it at least seemed spoke right to me, when he said “You got to get it right in here,” tapping his finger to his chest at his heart. 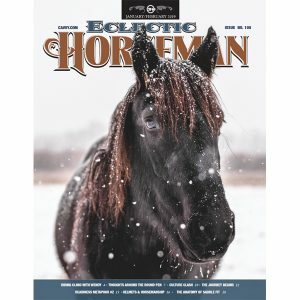 “You get it right in here, son, and then the horse will be easy.” It cemented for me the belief that horsemanship isn’t about working on the horse- it’s about working on ourselves. We’re the ones that have to change. I try to keep that with me. That whole philosophy and way of thinking truly changed my life. I rode in many Ray Hunt clinics and have a lot memories, but one in particular stands out. I was riding a horse that was hot bred and very insecure and a stretch for my ability. I had gotten to the last day of the clinic and was relieved it was almost over. while we were cantering the horse lost track of me and hooked on another horse and bucked with his feet up over my head. I heard Ray’s voice “Ride him on” – it was not my first inclination, however, I sat down and pushed him forward and it worked out just fine. For the remainder of the clinic, Ray didn’t take his eyes off me—and I knew he wouldn’t let me get hurt. After the clinic ended, and Ray asks “how ya’ fixed?” He told me, “You can ride that horse—you just need the confidence to do it and that’s easy for me to say.” He made me dig deep and I loved him. I have a picture of Ray Hunt it’s not a photograph but a picture in my minds eye. Back in the 90’s a group of us Maine girls went to the Snake River Ranch to see Ray. He was riding Papouse and talking about the importance of walking your horse out. Terry and I were sitting on the fence watching and listening when right in front of us Papouse spun three times to the left then leapt over and spun three times to the right. I only know it was three times because I had to ask him. Then I said how’d you do that and he said I just stopped the hind and kept the front going. I am so thankful that I had the opportunity to meet and ride with Ray Hunt, a very special person to me. Although I am a third generation horsewoman and thought I knew quite a bit about horses, my life took a turn for the better after having the privilege of meeting and watching Ray work with a bunch of horses in Catasacquaw, PA. It was what Ray knew and understood about horses, I knew, I had been missing. Since that time, his quiet ways and his way of saying things have been with me on a daily basis as I work with horses and people in an effort to give folks the knowledge and understanding they need to be safe, have fun, and get results. I can honestly say Ray changed my life for the better and I will spend the rest of my life honoring that and what he gave me. I have always felt that I knew him for a life time.But I only meet him once in a cold arena out in Alberta,Canada.He was everything that I thought he would be. A Cowboys cowboy. A Horseman’s horseman.Yes he was a LEGEND but he made you feel like a friend.Like you really did know him your whole life.As the day finished and we parted ways I realized that through his teaching,kindness and understanding that we all really did know him for a life time.God bless you Mr.Hunt and We will never forget what you have done for us. He started my colt in a clinic back in May of 1998 in Maryland – there were only three colts in my class – felt like I had private lessons with a master. They are four of the most exciting and memorable days of my life. Couldn’t sleep a wink trying to remember all the things he said. I also audited two other clinics – learned so much from him. He changed my life and all my horses lives for the better. 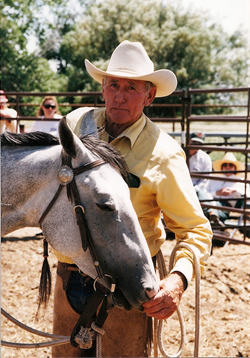 He helped so many horses in his lifetime – he will be sorely missed. 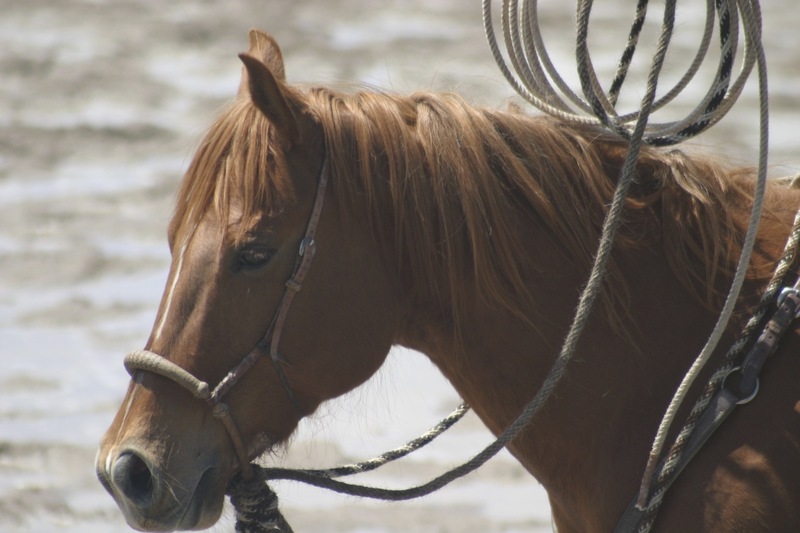 He has a true place in heaven – did it all for the horses – his first and true love!! I went over to the fence to visit with him, about a horse I was having a problem with, when I was first getting to know about this good way to work with horses. I told him that this very large and nervous horse would back up just as fast as could be when approached from the front by anything it was suspicious of, which was just about everything. Then he kindly added that what might be better, would be for me to back up with the horse, if he goes for a mile, I be ready to go for two, if he goes at a walk, I’d be ready to go at a run, until he decides to stand still. I’ve applied that idea, in so many ways, so many times, I’m eternally grateful. One more, that has stuck with me as a favorite of mine, I was watching Ray ride a green colt, in a small space with a bunch of other unruly critters, lots of commotion- asking his colt to go forward and out the opening. Ray kept slapping the colt on the rump, and mid slap -his hand was on it’s way down for another pretty good smack, the colt went forward, and Ray’s hand just stopped, in the middle of it’s swing, and he rode forward. That was one of the best lessons in timing I’ve ever had. I’m so sad, for the people and for the horses- that Ray has passed on. But I’m also so grateful, for all the good he has brought, carrying on and developing the work that Tom was doing. Passing on is an especially sacred time, it brings us closer to the reality that there is more to Life than meets the eye. I came for the horsemanship, and stayed for the lessons in life. Ray’s ability to focus completely on the moment deepened experiences with him. There were many times we will never forget, ones that made us laugh and ones that brought tears to the eyes, not sad tears but the ones that come when deep-felt emotions surface. The joy of being with him and the laughter comes back when I remember special times with Ray and Carolyn: his trail ride with U S Park Police in Washington, D.C. and our trip to Spain. On Friday, March 13, 2009 two things happened. One, I got older, no wiser, but older, 75 to be exact. Two, the riding world lost another of our last giants. Ray Hunt, unquestionably one of about a dozen of the best riders, teachers, mentors, of this and the last generation, succumbed to respiratory failure on that day. Last fall I spent several days auditing a clinic with Ray in Wickenburg, AZ. He was restricted to riding the back of his truck in a chair. Graciously, he invited me to sit with him, since I was recovering from hip replacement surgery. Just two old horse backers/riders sitting in the sun doing what they do; learning more about what we do. Ray was in his “zone”. He was helping people to help their horses, and to help themselves. 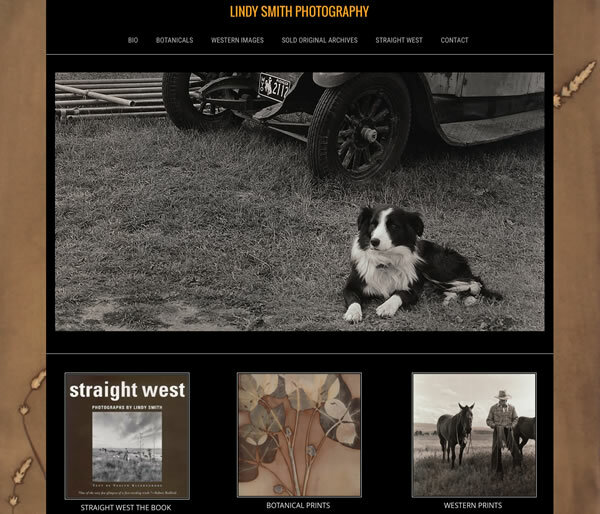 Carolyn, his marvelously talented wife, (and his best friend), supervised and conducted the business aspects. Together, they were a beautiful pair. Carolyn in her own way is very much a part of what made Ray special. She was his rock. She made it happen. Ray never hurried, but then we were taught by the Master of us all, Tom Dorrance. He never became tense, uptight, or lost patience, and while his mantra “It’s never the horses fault” he likewise never blamed the rider for not knowing better. He just helped them to learn better. Ray forgave mistakes, he helped some to overcome a lack of knowledge, skill or inexperience, and he always helped to build a bond of confidence and trust between the rider and the horse. 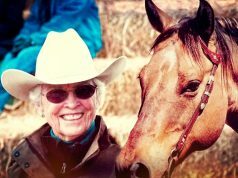 The horse world changed forever a few years ago and it was because of Ray Hunt, Tom Dorrance and his brothers, Fred and Bill. These were the first real disciples. 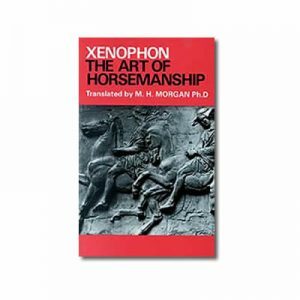 There were no illusions about “Natural Horsemanship”. It was all about finding a better way for two totally different biological creatures to survive with each other in a manner that caused no harm to the other. Our world is a better place because of Ray Hunt and his family of friends. Ray was a wonderful influence and inspiration in my life. 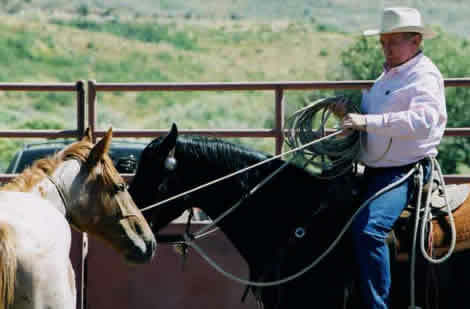 I will always remember the first time I saw him ride, it was a 4 day Colt Starting and Horsemanship Clinic at Robert Wagners ranch in California. I was lucky enough to be able to start a colt with Ray and also assist in the filming of his DVD. Ray was captivating to listen to and thrilling to watch. A horseman who could not only ride as if he were a Centaur, but who worked in such harmony with his own horse that he could make it appear easy. Ray was passionate about horses, it was apparent in every breath he took. His voice resonated with authority and sureness, because he’d literally ‘been there and done that’. One night we were talking about some of the things he’d done in his life and he told us about his days ‘mustanging’. The picture he painted for us in words made it as real as if we were right there riding alongside him. It was fantastic. Ray Hunt was never afraid to admit that he had made some mistakes along the way with horses, but you could be sure that he had also managed to rectify those mistakes. He was understanding enough to appreciate that you might make some mistakes with your horses, but then again, you could also be sure he expected you to work at that and fix it up. Ray Hunt was 100% for the horse and if you really wanted to learn, he was right there for you; but if you wanted to blame the horse for your shortcomings, you better get ready to be ‘hauled over the coals’ because Ray would not tolerate any unnecessary condemnation of the horse. He would tell you the horse was doing the best he could and that YOU needed to change. When he spoke about this, you knew, you believed, that what he said was real. It was something that a man could strive for. You also knew that you might never achieve what you might see in others, but that should not stop you from trying; because even though Ray could get pretty caustic, he was always ready to help you when you were ready to put in the effort. His gift to the world of horses was deep and profound. The legacy of Ray Hunt manifests itself in the desire and hope of many people worldwide who strive to emulate his remarkable ability and insight. I value greatly the times I had with Ray Hunt.